The Flower Teams are responsible for arranging the flowers on a weekly basis for church events and celebrations at St Ambrose and Our Lady & St Pius X. At St Ambrose we usually arrange the flowers on Friday afternoons and new volunteers would be warmly welcomed, no experience is necessary. 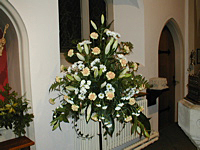 If you are getting married in St Ambrose or Our Lady & St Pius X, we are available to arrange your church wedding flowers.